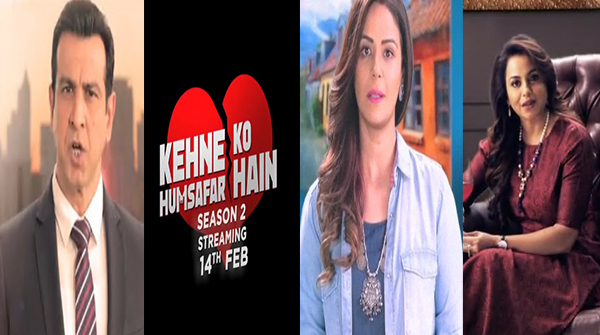 Kehne Ko Humsafar Hain Season 2 All Set To Launch On 14th FEB! ALTBalaji web series Kehne Ko Humsafar Hain is all set to launch season 2 on Valentine’s Day, February 14, 2019! The gained massive viewership on the ALTBalaji app by 300% in just one week. Starring television’s powerhouses Ronit Roy, Mona Singh, and Gurdeep Kohli, the story picks up from where it had ended. Mona Singh’s character Ananya Sharma has left the city leaving Rohit to think about how their marriage too had to face hardship. While Poonam has moved on from her divorce from Rohit, what does fate have in store for them? The latest promos released manage to showcase three sides of their emotions, one being finding inner peace, second being able to stay vocal, and third, trying to face the mirror. Season 1 began with Rohit and Poonam’s story of a marriage facing hard times. While Poonam was living her bubble of a happy marriage, Rohit was feeling lonely and disconnected from their long marriage but found an exciting new connection with Ananya after working on a project together. A dull lifestyle soon becomes lively with someone Rohit felt he could connect. Soon the secret love affair became a question for Ananya and those around him. What was this affair? True love, pitty or a game? Kehne Ko Humsafar Hain season 1 gave viewers insight into the characters, their feelings while leaving them “normal.” No villains, no ideal bahus or betis. These were just everyday humans tangled in human emotions which were bound to family, society and unknown questions. After a bit of tiff and emotional drama, Poonam and Rohit accept their marriage has come to an end. Moving on, Poonam finds hobbies and time for new exciting adventures that she never pursued during her marriage. It will make you think, why do women always have to place her dreams and “to dos” on hold? She manages to leave you inspired to move on and try something new. While the daughters initially struggle, they do end up finding a balance. As they say, time heals all the pain, and so it did till some degree for Bani (Pooja Banerjee) and Nikki (Palak Jain). Bouncing back to Rohit and Ananya, they too saw the bliss of a happily married couple, but with a salt of split Rohit and his thoughts. The man never really fully committed, nor managed to be vocal much. For a viewer, he was mixed pendulum at times. His actions and thoughts somewhere lead to Ananya feeling boxed in a marriage that was not valued. As the show is all set to begin this month, relive Kehne Ko Humsafar Hain season 1 on ALTBalaji and get ready for new twists and turns to unravel with season 2! Heartiest Congratulations To The Content Queen Ekta Kapoor As She Welcomes Her Baby Boy! Check Out 10 Best Photos Of Erica Fernandes Turned Into Sketches And Drawings! This is what happens when you cheat!!! !